This is a good general purpose laboratory instrument. It employs an achromatic objective of 25 mm aperture and 17.5 cm focal length. 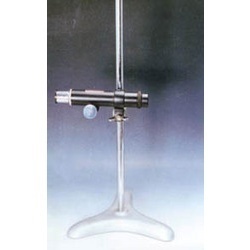 The telescope is mounted on a sturdy stand with ½”steel C.P. rod, focus by smooth rack and pinion, 10 x rams den eyepieces are used. Supplied with scale and scale holder. The sensitive focusing adjustment and wide range of working distance make this telescope a useful laboratory instrument. PSAW is one of the renowned companies involved in manufacturing and supplying a range of engineering and scientific equipment that includes physics and chemistry lab equipment, laboratory consumables and glassware, surgical equipment and many more. Products offered by us are designed with precision under strict supervision of our well experienced professionals. At each stage of manufacturing process, stringent quality audits are conducted to assure flawless product delivery. Use of fine quality raw materials procured from registered and reliable vendors makes our product durable, strong, abrasion resistant and reliable. We are committed in offering our clients with highly durable and dimensionally accurate products that meet the international quality standards.